The Fort Victoria Country Park is a 22 hectare (55 acre) park on the edge of Yarmouth, offering seashore and woodland walks, with fine views across the Solent to Hurst Castle and along the north coast of the island. The Islandʼs Costal Path runs through the park following the old Military Road that once connected Fort Victoria with Fort Albert. If nothing else, itʼs a good place to while away a hour or so whilst youʼre waiting to catch the ferry back to Lymington. Fort Victoria was originally built between 1852 and 1855 as a massive gun battery. However, within ten years of its construction, rapid advances in technology rendered it redundant, and it was replaced by five newer forts around West Wight. It remained an Army base, however, up until 1962, being used as a searchlight base, as a submarine mining base, and latterly as a training camp. It is now home to a Marine Aquarium, an Underwater Archaeology Centre, a Planetarium, a Model Railway, a Café and a number of retail outlets. One casemate has been restored to something like its original form and houses a 68-pounder cannon on a replica mount. A short way away from the main casemates lie the remains of a See-Saw Searchlight Emplacement. This was a novel arrangement in which the lamp and a mirror were mounted on opposite ends of a girder, pivoted in the middle. This allowed the lamp to remain protected by the bunker whilst the light was reflected by the mirror. 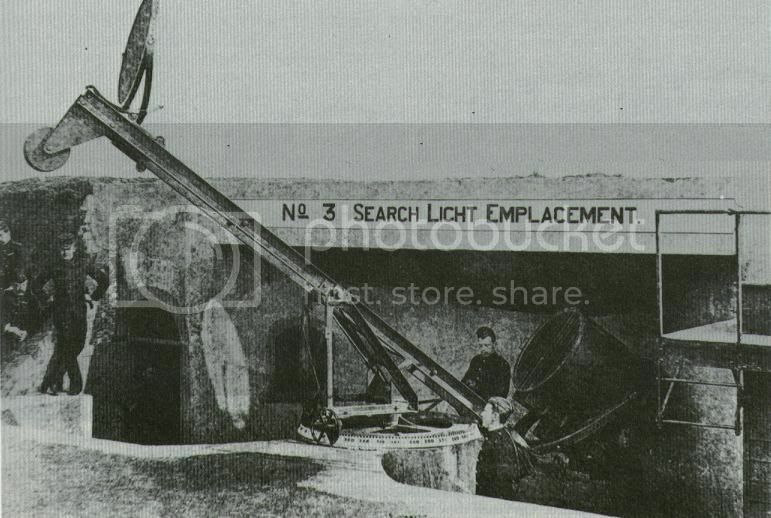 This old photo held by the Royal Engineers Museum illustrates the set up. Just outside the park, Fort Albert was completed in 1856, after 4 years of construction. Like Fort Victoria it was quickly rendered obsolete by the introduction of armoured ships. It remained in Army hands until 1957, being used for some of that time as a base for Brennan torpedos, the worldʼs first practical guided torpedo. It is now in private ownership, and has been converted into private flats. There is no public access. However you can get a reasonably good view from the far end of the Country Park.